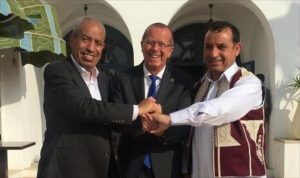 UNSMIL chief Martin Kobler has welcomed the reconciliation agreement signed yesterday in Tunis between Misrata and Tawergha, which could see the return of 40,000 Tawerghans to their town before the end of the year. The deal is the culmination of talks that began in May last year brokered by UNSMIL. It provides for compensation for members of both communities to be paid from a special fund to be established by Faiez Serraj’s government. “After five years in very difficult conditions, it is heartening to know that the Tawerghans have finally a real chance to return before the end of the yea ” said Kobler, adding “Misratans were also victims of this conflict and have every right to seek compensation”. He urged both sides to ensure that the agreement was carried through without any conditions. The deal has also been welcomed by the National Forces Alliance of Mahmoud Jibril. However, today a Misrata municipal council spokesman warned that reconciliation with the Tawergahans still had a long way to go. Usama Badi appeared to suggest that the agreement celebrated yesterday in Tunis was not in fact final. He also said that reconciliation was a national project.